We speculate that the threshold of MerR response can also be manipulated by controlling the concentration of MerR in cytosol. As with the bacteria in natural environment, the concentration of MerR is maintained at certain level. In order to verify the speculation, promoters from parts.igem constitutive promoter library with different strength were prefixed before BBa_B0034+MerR coding sequence to exogenously maintain MerR expression at different intensity (Fig.6). 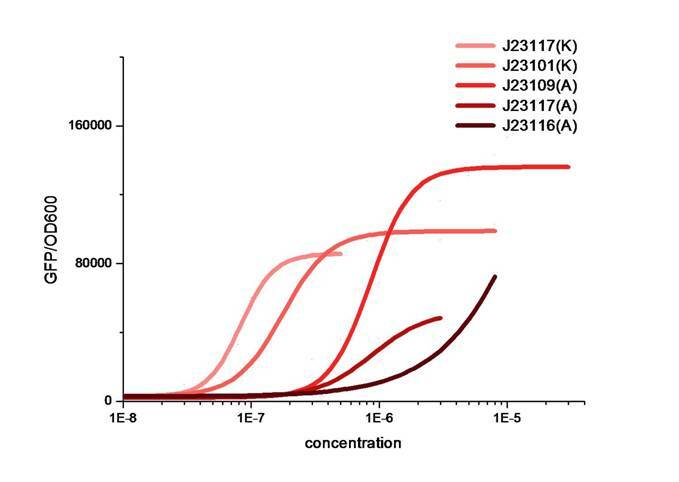 The sensitivity of PmerT under different MerR concentrations can be denoted by mercury concentration at which reporter (GFP) expression emerges. 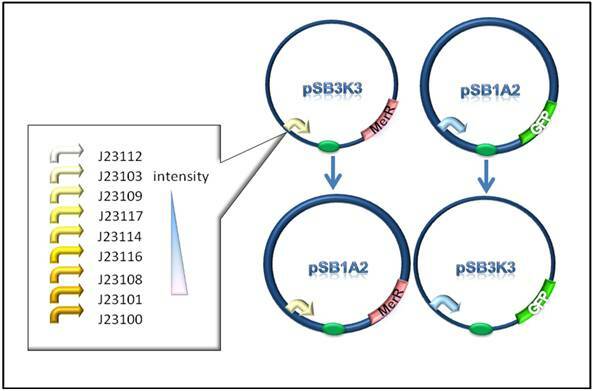 Furthermore, we used pSB1A2 and pSB3K3 as backbones because of their different copy numbers which could also result in different MerR expression intensity (Fig.7), confirmed by an additional experiment. Fig.6. The construction of the system used for MerR operation characterization. Promoters from the parts.igem with different intensities were selected, leading to varying MerR concentrations. The transcription of PmerT is controlled by the percentage of Hg-bound MerR dimer, and only Hg-bound dimer could activate transcription. We carefully tested every combination (the strength of constitutive promoter controlling MerR expression and the backbone copy number) under induction with a Hg (II) concentration gradient ranging from 10^-9M to 10^-5M. The concentration gradient of Hg (II) is: 0, 1E-9, 3E-9, 5E-9, 8E-9, 1E-8, 3E-8, 5E-8, 8E-8, 1E-7, 3E-7, 5E-7, 8E-7, 1E-6, 3E-6, 5E-6, 8E-6, 1E-5, 3E-5, and 5E-5. Cell culture was cultivated for 8 hours and then diluted with fresh LB in a ratio of 1:100. Continue to incubate until the OD600 reached 0.4~0.6. Fig.8. The expression intensity of MerR significantly determines the threshold of sensitivity to mercury (II). Five representative lines are selected and it can be observed that the thresholds have varied apparently. The letter in the bracket after each promoter name denotes the backbone (pSB3K3 or pSB1A2) where Pc-RBS-merR was cloned. The deeper the colour, the stronger the expression level of MerR is, leading to a higher threshold. 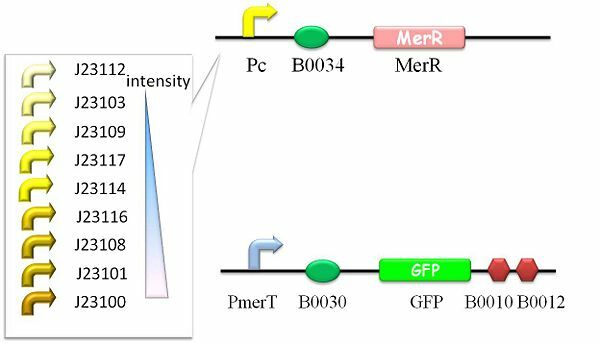 The sensitivity of PmerT under different MerR concentrations can be denoted by mercury concentration at which reporter (GFP) expression emerges. Data demonstrates that cells with different MerR intensity exhibited correspondingly different sensitivity to mercury, indicating that the stronger the expression level of MerR is, the higher threshold is represented. We used a modified version of team Peking 2010´s mercury biosensor. We used an E. coli codon optimzed version of the activator BBa_K1758340 and combined it with their mercury responsive promoter which is upstrem of a expression enhancing 5´UTR and sfGFP BBa_K1758342. Using this two we could characterize the mercury sensor in vitro in our CFPS system.